Also present were Bill Dowling, Joan Karpf and David Scalley. Time: 7:00 PM A quorum being present, Chairman Foster called the meeting to order. Page 4, 4th paragraph, 1st line, change �the Board� to �the Town�s engineer�. Page 5, 5th paragraph, 3rd line, after �Chairman Foster said she�, add, �was not trying to micro manage but to get an idea of how to come up with a budget for the secretary�. Page 5, 6th paragraph, after, �Mr. Bergum suggested�, add, �the secretary draft�. Page 5, 6th paragraph, after, �an Excel spread sheet�, add, �which would help her track and would total the time. Dr. Karpf asked that a typo on page 4, 6th paragraph, 8th line down, �s�, be deleted. Dr. Karpf offered a motion to approve the minutes of November 7, 2013 as amended. Mr. Bergum seconded the motion. The vote was 6 � 0. The motion carries. Mr. Bergum questioned #5 on the report (attached) and asked what and where is the Italian Vista building. No one could give an answer. Chairman Foster said it is a demolition and would not come before the Board. Mr. Bergum said he would look into it on his own and on-line. Dr. Karpf said, regarding #14, it is noted �FunTowne (Karpf).� Dr. Karpf said he wanted to state publically that he doesn�t refer to it as FunTowne and that wording was the Code Enforcement Officer�s choice of wording. Chairman Foster said the Fire Chief had spoken to her about the Mount Washington Hotel using compressed natural gas for heating. Mr. Bergum said he understands that the Mount Washington Hotel is investigating if this would be economical for them. He said, it may come to the Board. Mr. Hogan said the survey has been printed, envelopes stuffed Tuesday evening and they were mailed Wednesday. He said there were over 1250 envelopes. Some people have already received them. Mr. Bergum asked if they were at the stage to incorporate different reports. 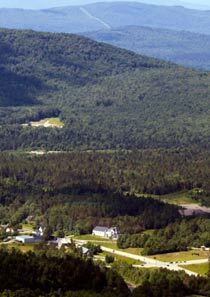 He said the Ammonoosuc River Corridor Management Plan, in his opinion, should be included. Mr. Mills said the committee was not there yet but will include that Plan. Mr. Bergum said it is a solid document. Chairman Foster said the hazardous mitigation plan the Town would use to shelter people in case of an evacuation should also be included. Mr. Mills said that would be described in the FEMA documents. Ms. Moroney said, Dan Walker (Emergency Management Director) is updating the Emergency Management Plan that John Goodney developed and the Master Plan would reference that document. Dr. Karpf asked that everyone review this update. He said he finds it comprehensive and in line with most everything the OEP (Office of Energy and Planning) has outlined. He said the Board could pick this up in January. Chairman Foster said the update should be reviewed to see that it corresponds to what is written in the other Regulations and the Ordinance. Dr. Karpf said Section 307 (b) Non-Conforming Lots has been changed by Court ruling. Presently it states; �If two or more contiguous undeveloped lots are in single ownership at the time of this amendment of the Ordinance, and if each or any of the lots does not meet the frontage requirements, the land involved shall be considered a single parcel.� He questioned if the Board needs to change the Ordinance. Dr. Karpf said two (2) Public Hearings must be held and a warrant article written and taken to Town Meeting if the Board wants to change the Ordinance. The deadline to publish and post the first public hearing is December 27th . The consensus of the Board was to hold the first public hearing on January 2, 2014. The second public hearing must be published and posted by January 7, 2014. The second public hearing date will require a special Planning Board meeting. The Board agreed on January 16, 2014 to hold the second public hearing. Mr. Bergum said that in most cases, the stricter (rule) applies and asked if that would not be the case in this matter. Ms. Karpf said the courts have found that requiring combining parcels is not legal. Chairman Foster said she has heard in workshops that the courts are finding more in favor of property owners in these situations. Dr. Karpf offered a motion that Chairman Foster get legal advice regarding removing 307 (b) from the Town of Carroll Zoning Ordinance and that the public hearings be published and posted together for the public hearing dates January 2, 2014 and January 16, 2014. Mr. Bergum seconded the motion. The vote was 6 � 0. The motion carries. The Secretary will draft the notice and e-mail it to the Chairman for review. Mr. Bergum complimented the Secretary on the sample spread sheets she developed. He said he would add a column for the date and a sub-description or other differenciation for one owner who might have a number of different projects. Discussion took place regarding delivery of mylars to the Registry of Deeds. It was noted that when mailing the mylars, the plan number is not immediately obtained and must be requested later. The Police Chief goes to the Registry almost every Monday and could take any mylar(s) up at that time. Mr. Hogan questioned if waiting for the Chief to go on a Monday would not cause a delay. The Secretary said that usually the time lapse would not be a problem. Mr. Bergum asked what the Secretary would get paid if she took the mylar(s) to the Registry. Ms. Dowling said the applicant would pay a flat $37.00. Mr. Mills asked if there was any impact on the Police Department. Ms. Moroney said that there would be none. The consensus of the Board was to charge $40.00 if the Secretary would be required to take mylar(s) to the Registry, to be paid for by the applicant. The Police Department would be the usual means of getting the mylar(s) to the Registry at no cost to the applicant. The Secretary will draft a chain of custody type document for the Police person to sign and have signed at the Registry along with the Plan Number and have it returned to the Secretary for filing. The issue was tabled until the January meeting. The Secretary will draft a formal job description with the changes discussed for that meeting. Chairman Foster said the process for a voluntary merger is; the application is obtained from the Tax Collector, it is filled out and submitted to the Planning Board. The Planning Board, per RSA 674:39-a, must approve the merger if it does not create a violation of current ordinances or regulations. No public hearing is required. After Planning Board approval, the request goes back to the Town Clerk who notifies the Assessors. Mr. Bergum offered a motion to accept the application for Voluntary Merger from Albert Pearce and Jane Connell. Dr. Karpf seconded the motion. The vote was 6 � 0. The motion carries. Dr, Karpf offered a motion to approve the voluntary merger for Map 203-009 Lot 004-004 and Map 203-009 Lot 005-005 Albert Pearce and Jane Connell 106 Woodland Acres. Mr. Bergum seconded the motion. The vote was 6 � 0. The motion carries. The Secretary will put the signed merger and the check for the Registry of Deeds in the Town Clerk�s mail box. Chairman Foster said she addressed the Budget Committee on Wednesday night. She added $300 to the Office Supplies line. Mr. Hogan said he looked into a digital recorder and software for the Secretary. At Staples the cost was $299.00 which included the software and recorder package. Dr. Karpf said there is also a need to be able to back up the external hard drive. Various means were discussed including Carbonite and My Cloud. It was stated that the Town was moving forward in acquiring a �cloud� type automatic back-up. It was the consensus to wait and perhaps be included with what the Town decides on. Mr. Bergum offered a motion to purchase the software and digital recorder for the Secretary. Dr. Karpf seconded the motion. The vote was 6 � 0. The motion carries. The Planning Board and the ZBA will split the cost of the package as the Secretary will use it for both Boards. Chairman Foster said she increased the Legal line to $2,000.00. She said that the Rines case and the Hunt case are still to be decided. She said in 2012, the Rines case cost $7,000.00. She said she also increased the Secretary�s line a bit, due to an increase in the hours she works. A discussion regarding future procedural changes took place. Areas to be looked into are the duties of the Chairman and reimbursement to the Town for costs of workshops that a member signs up for but does not attend. Mr. Hogan said as point of interest, the legislature will vote on a bill that all veterans, 100% disabled, will pay no taxes. Chairman Foster said on January 2nd Tara Bamford of North Country Council will be present to assist the Board regarding scrutinizing our Regulations and Ordinance. She said North Country Council is the only regional planning commission that is funded to assist Towns with economic development. Mr. Bergum offered a motion to adjourn. Mr. Mills seconded the motion. The vote was 6 � 0. The motion carries. The Secretary was asked to post a joint meeting of the Planning Board and ZBA for January 2, 2014 for Ms. Bamford�s presentation. 8:00 PM Chairman Foster adjourned the meeting.